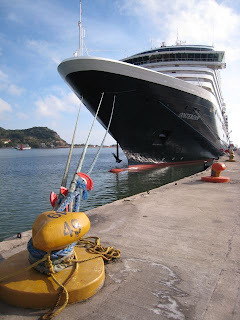 The handsome OOSTERDAM at Mazatlan. Photo and copyright Peter Knego 2007. November 6, 2007: After buffet breakfast overlooking the pounding surf at Costa de Oro, we repacked our bags and head via pulmonia (open air taxi) down Mazatlan’s riviera to the cruise ship terminal, adjacent to the historic old town and its skyline of cathedrals and palm trees. 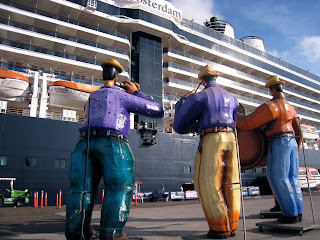 Inside the security zone lay the OOSTERDAM (the double Dutch “oo” is pronounced like the “o” in “toast”), the second of Holland America’s Vista Class quartet of 82,000 gt floating pleasure palaces. 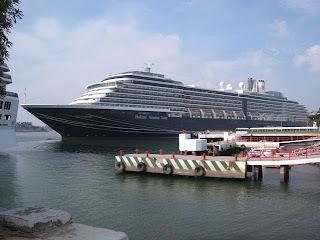 Built in 2003 by the Marghera (near Venice) Yard of Fincantieri, she followed the ZUIDERDAM of 2002 and was joined by the WESTERDAM of 2004 and the NOORDAM of 2006. All are named for the four points of the compass, carry either 1,848 or 1,916 passengers and 800 crew. 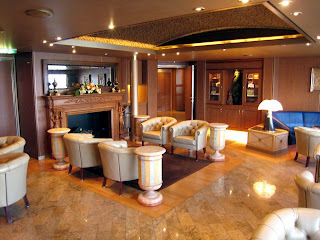 They have 11 passenger decks, 14 elevators in three banks and 24 public rooms. The OOSTERDAM is 950 feet long, 106 feet wide and has a 23 foot draft. She is powered by 5 diesel engines and 1 gas turbine that can drive her twin azipods at a maximum speed of 23 knots. Muted mariachis of Mazatlan. Photo and copyright Peter Knego 2007. A shuttle took us to the ship where a tall sculpture of a mariachi band faced the gangway. Once through security, we headed to cabin 4039 on forward starboard Deck Four. 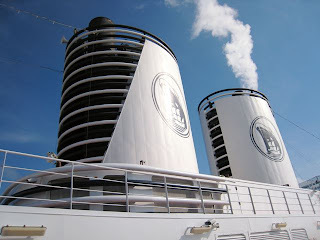 It was great to step out of the mugginess and mosquitoes of Mazatlan into the air conditioned climate of the OOSTERDAM. 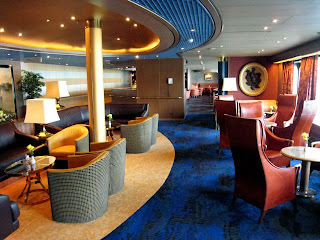 This was my first time back on board since the ship’s two night inaugural cruise in 2003, which was basically enough to get familiar with the layout and Frans Dingemans-designed ambiance but not enough to fully experience what Vista class cruising is like. Cabin 4039, facing starboard. Photo and copyright Peter Knego 2007. Our deluxe verandah had a plush Signature of Excellence queen sized bed (which we had converted to two twins), a separate sitting area with convertible sofa, two closets, a verandah (with solid steel as opposed to plexi-glass railings), bathtub and shower, full length windows, flat screen television with DVD player, desk, two night stands and a mini-bar. 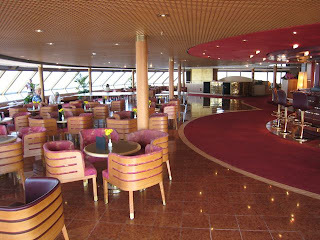 The Atrium, facing aft/down from Promenade Deck. Photo and copyright Peter Knego 2007. 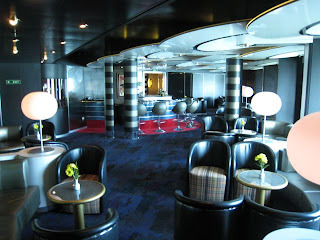 I had time to wander the mostly empty ship and take photos of the various public rooms on Lower Promenade and Promenade Decks. 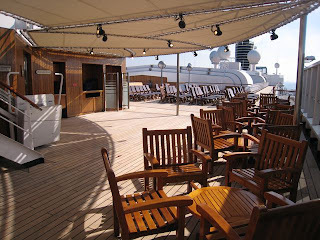 Little had changed since my last time on board, although I understand the handsome Crow’s Nest on Observation Deck (10) will ultimately be divided in half to accommodate a new Explorations (internet cafe). This will be done in a drydocking that will also extend the aft upper decks to increase the capacity from 1,848 to 1,916, somewhat compromising the ship’s balanced profile (WESTERDAM has already been “expanded”, ZUIDERDAM will be expanded in 2008, and NOORDAM was built that way). 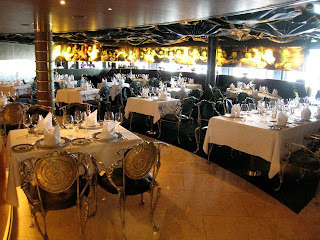 A section of the Lido Restaurant. Photo and copyright Peter Knego 2007. Several of our Uncommon Journeys group met in the Lido Restaurant for lunch (I was back in form with two large bowls of salad dressed in olive oil, vinegar and parmesan with a slice of pizza margherita and freshly cooked farfalle marinara with extra garlic). A detail of Stephen Card’s RYNDAM stairtower painting. Photo and copyright Peter Knego 2001. 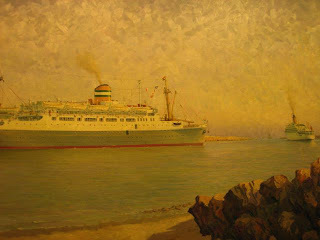 It was great to see Stephen Card’s lifelike oils in the forward stair tower, my particular favorite being the RYNDAM (1951) in the Suez Canal behind P&O;’s ORCADES. Facing aft from forward port Sports Deck. Photo and copyright Peter Knego 2007. Facing aft along port Observation Deck. Photo and copyright Peter Knego 2007. Fuming funnels. Photo and copyright Peter Knego 2007. Aft Sports Deck, facing forward. Photo and copyright Peter Knego 2007. Over the OOstern from aft Sports Deck. Photo and coyright Peter Knego 2007. 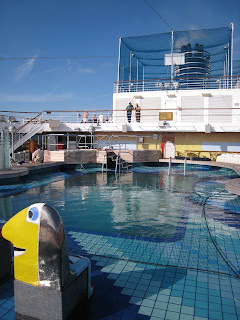 The aft pool area, facing forward. Photo and copyright Peter Knego 2007. I continued documenting after lunch, climbing around the upper decks, Greenhouse Spa and Crow’s Nest. With the temperature hovering around 92 and the humidity at eighty percent, it was miserable outside. 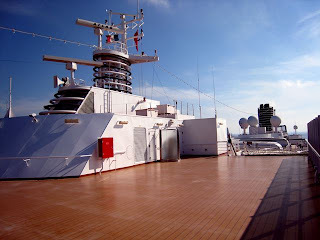 Nonetheless, I walked all over the ship and even disembarked to get some views of her at the terminal, not seeming to bother the armed guards in the vicinity. A laid up Mexican ferry was several hundred yards ahead of the OOSTERDAM but inaccessible behind a chain link fence. One of her active and identical sisters was off toward the harbor entrance, preparing to sail (to La Paz, perhaps?). 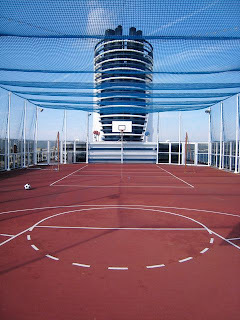 The Fitness Center, facing port. Photo and copyright Peter Knego 2007. Were it not so hot and had I not been ravaged by mosquitoes, I might have taken the opportunity to explore Mazatlan. DEET makes me almost as dizzy as the mosquitoes it wards off and I had my full share of wearing it in India on my last expedition. So, I headed to the gym for the first time in over a week, noticing a few people were staring at my arms and legs, which had about ninety deep red, swollen bites that looked like smallpox lesions. After some self-conscious curls, I called it quits, returning to the cabin to cover up and catch the very end of the Uncommon Journeys cocktail party in the Crow’s Nest. Coincidentally, Holland America has a number of executives on board this week along with several journalists. The Crow’s Nest, facing starboard. Photo and copyright Peter Knego 2007. 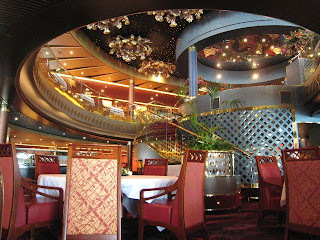 The Vista Dining Room, facing aft from starboard Promenade Deck. Photo and copyright Peter Knego 2007. A writer friend, the talented and fabulous Johanna Jainchill (TRAVEL WEEKLY), asked me to join her in the Crow’s Nest for a press party before adjourning to the Vista Dining Room. Service was impeccable (thank you, Emilio!) at our table on the lower level near the stern, where I enjoyed a chicken caesar salad from the “Available Daily” section of the menu and a glass or two of delicious Stella Maris cabernet. 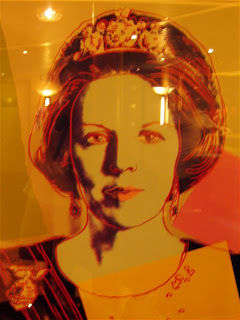 One of the more interesting works of art on board, a Warhol print of Queen Beatrix, sort of “tradition with a twist”. Photo and copyright Peter Knego 2007. 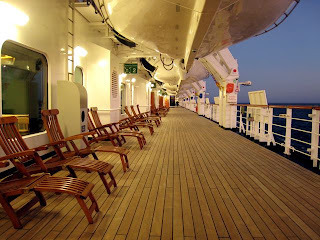 After dinner, I enjoyed a walk through the public rooms, around the ship’s beautiful promenades and the Deck 10 jogging track. A large Grand Class Princess (GOLDEN, perhaps?) overtook us well off our starboard side. 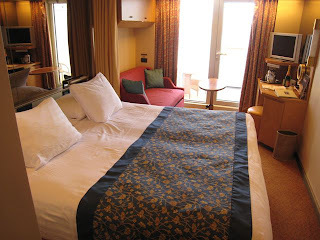 Finally, I went to bed, savoring the comfort of the Signature of Excellence bedding well into the late morning hours as OOSTERDAM gently podded southward along the Mexican coast. OOSTERDAM at Puerto Vallarta. Photo and copyright Peter Knego 2007. 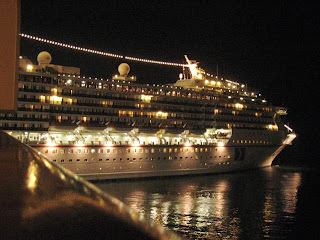 November 7, 2007: I barely recall peeking through the curtain early this morning to find the perfectly lit CARNIVAL PRIDE at her berth, not managing to dig out the cameras (sorry, PRIDE fans!) at the risk of not getting back to sleep. When I finally did awaken, steamy Puerto Vallarta harbor and a new high rise hotel or two lurked beyond the channel. 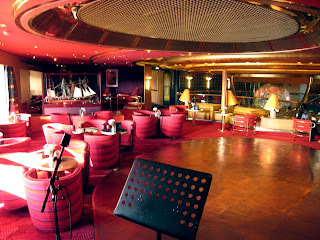 I finished documenting the OOSTERDAM’s public rooms before joining friends in the Pinnacle Grill for lunch. The Pinnacle Grill, facing aft/port. Photo and copyright Peter Knego 2007. The service in the Pinnacle ($15 for lunch and now $30 for dinner — included in the Uncommon Journeys package) is impeccable and the setting is sublime with intimate alcoves, Gaudi-esque aluminum-framed chairs, Reidel stemware and oversized, elegant china. My starter was a thick onion soup, followed by a roasted rosemary chicken breast and a delicious raspberry sorbet. Vista Sista! 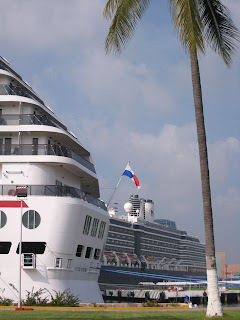 OOSTERDAM and her common platform (same hull and machinery) Carnival “sister”, the CARNIVAL PRIDE, at Puerto Vallarta. Photo and copyright Peter Knego 2007. 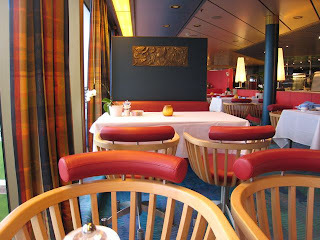 Situated to the aft/starboard side of The Crow’s Nest, it appears as though the Oak Room will be incorporated into the Explorations Cafe when the OOSTERDAM is given her next major refit. Photo and copyright Peter Knego 2007. 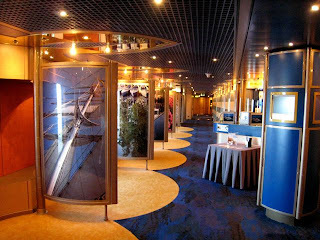 Photo Gallery on Promenade Deck, facing aft. Photo and copyright Peter Knego 2007. The Promenade Deck lobby between the Library and Internet Center, facing forward. Photo and copyright Peter Knego 2007. The Library, facing forward. Photo and copyright Peter Knego 2007. 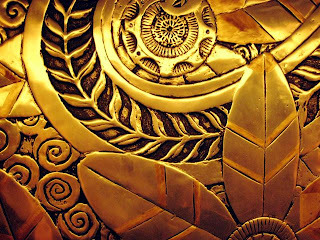 Nice Art Deco style detailing on the OOSTERDAM’s elevator doors. Photo and copyright Peter Knego 2007. 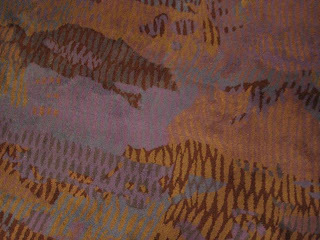 Random carpet sampling. Photo and copyright Peter Knego 2007. From various nooks, I soaked up the uniquely rich, deep colors of the soft fittings and brass accents that distinguish HAL from the airy, pastel decor of most other “premium” market cruise lines, finally settling in at the Lido where the haze lifted ever so slightly to reveal the mountainous coastline of Puerto Vallarta beyond the sprawling WalMart complex on our port side. DJ Jazzy (aka Jeff Davis). Photo and copyright Peter Knego 2007. Certain people we encounter manage to follow a similar, if separate life course. Twenty years ago, when I began my music industry career, Jeff Davis ruled the dance music scene in Chicago. One of the coveted 100 Billboard magazine reporting disc jockeys, he influenced what got on the dance music chart, a market that determined whether a song had the “legs” to break at pop radio. Artists like Madonna, Cher and Justin Timberlake always rely on this chart to break their latest songs. 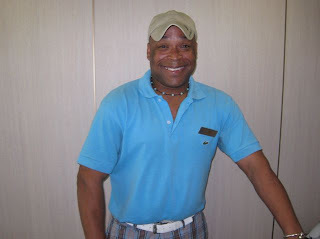 Jeff is now HAL’s head disc jockey and is known upon the seven seas as the ever-smiling, gregarious DJ Jazzy. 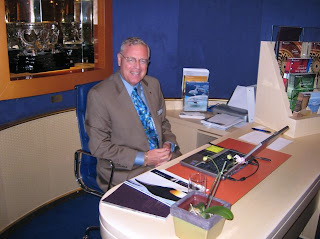 His first contract was on the DAWN PRINCESS (ex SYLVANIA, FAIRWIND) in 1992, which led to a five year stint with Princess before he joined Holland America in October of 1997 aboard the WESTERDAM (ex HOMERIC, now COSTA EUROPA). He loves spinning for a crowd whose lives go beyond the clubs, allowing him to play far more than just the latest, trendiest songs. 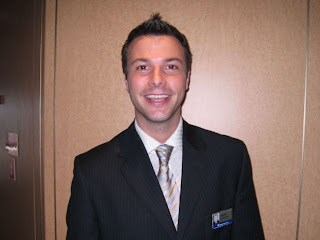 In addition to manning the dj booth, Jeff oversees many of the ship’s daily activities, including karaoke, various game shows and pool events. 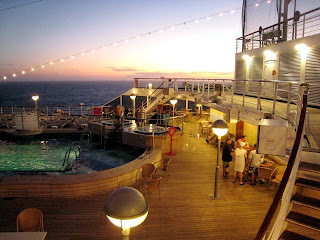 When not at sea, Jeff lives in Portland, Oregon and thanks cruising for keeping him grounded and happy. Extra garlic, please! Lito finesses the farfalle with a big smile. Photo and copyright Peter Knego 2007. PRIDE and polish. CARNIVAL PRIDE as seen from OOSTERDAM shortly before the latter departed Puerto Vallarta. Photo and copyright Peter Knego 2007. Christopher and I enjoyed a low key dinner in the Lido (more freshly-prepared garlic and marinara pasta, courtesy of Lito) as OOSTERDAM prepared for her 9:00 PM departure from Puerto Vallarta. 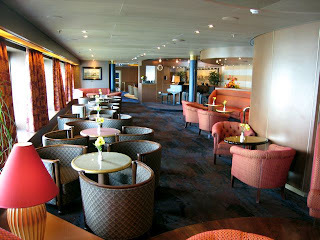 The Queen’s Lounge, facing port. Photo and copyright Peter Knego 2007. Adjoining the Queen’s Lounge, the Queen’s Bar, of course. Photo and copyright Peter Knego 2007. At 9:45, we went to the Queen’s Lounge for the “Broadway Moves to Queens” show featuring the HALCat singers doing an acoustic ensemble of favorite Broadway songs. At 11:00, we hit the Vista Lounge to watch talented Jeff Burghart’s “Late Night Adult Comedy” show before taking a stroll around the promenade. 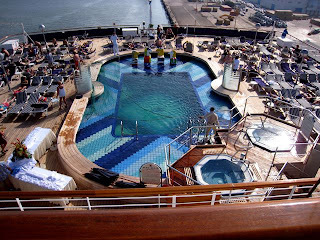 The good offices of HAL are being kind enough to provide some internet time so that I can post this blog as it progresses; otherwise, I am not privy to any of the standard media benefits on this cruise. So, I was pleasantly shocked when smiling Emilio, our waiter from two nights prior, greeted me by name in the Lido while I was cued up for my usual pasta and salad lunch. I can barely remember names at family gatherings, let alone a person in the din of a busy table of eight on a cruise among approximately 1,900 guests. It is really this kind of sweetness and sincerity among the mostly Indonesian and Filipino staff that elevates HAL from the norm. David Giventer at work on the OOSTERDAM. Photo and copyright Peter Knego 2007. David Giventer is a friend and ship aficionado that I have known for over a decade. We sailed together on the 1959-built SS ROTTERDAM and he is the proud owner of a nickel and brass “CP” railing I rescued from Carnival’s MARDI GRAS (ex EMPRESS OF CANADA) when she was broken up at Alang. 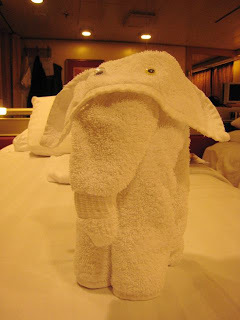 Needless, to say, it was a nice surprise to find him on board as Cruise Consultant. 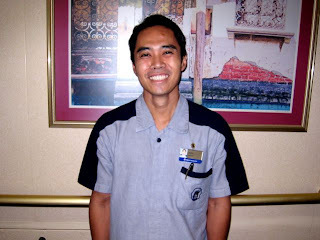 Prior to joining the OOSTERDAM’s staff this past September, David had logged in over 300 days as a loyal HAL passenger. He shared some nice anecdotes about life at sea in a working capacity. 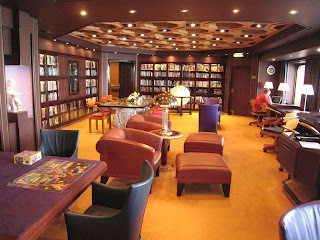 A “Giventer Sweet Spot”, the Explorer’s Lounge, facing aft. Photo and copyright Peter Knego 2007. Endangered? The starboard corner of the Crow’s Nest, shown facing aft, will be incorporated into the Explorations Cafe. What will become of its wicker furnishings and glass Tiffany-style ceiling treatment? Photo and copyright Peter Knego 2007. David is a fan of the Vista Class ships and, in particular, the OOSTERDAM. He loves the twin funnels, the easy to navigate layout, all the nice little nooks and crannies that are missing in most modern megaships, the overall interior color scheme and ship’s convenient San Diego-based itinerary (since it is a relatively short commute from his home in Tucson, AZ). 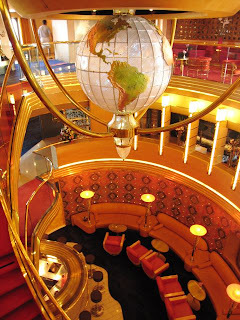 David’s favorite (or, as he terms them, “sweet”) spots on the ship are: the Crow’s Nest (as it is now), the aft Lido, the Explorer’s Lounge, and the teak promenades with their impeccably polished caprails and wooden deck chairs. His firsthand knowledge of the fleet and the company’s history should prove a great asset to HAL and any guests seeking his assistance. 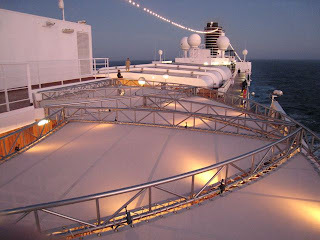 Aft from port Observation Deck at twilight. Photo and copyright Peter Knego 2007. Port promenade sunset. Photo and copyright Peter Knego 2007. Stern sunset. Photo and copyright Peter Knego 2007. 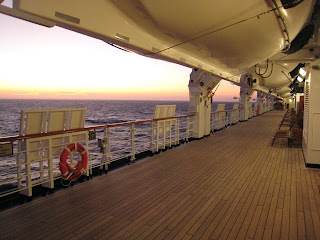 I meandered around the outer decks at sunset before going to the gym to continue my penance. At 8:00, I joined a gathering of Uncommon Journey-ers in the Vista Dining Room for a formal dinner that included a spicy black bean soup starter and a wonderful guava-stuffed, lemon-marinated chicken, served with caramelized mango and mashed sweet potatoes. 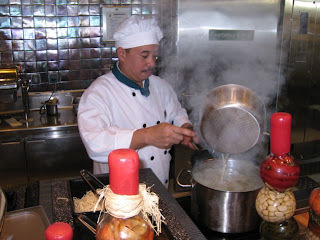 It was one of the best chicken dinners I’ve had on a ship: tender, sweet, savory, and piping hot. 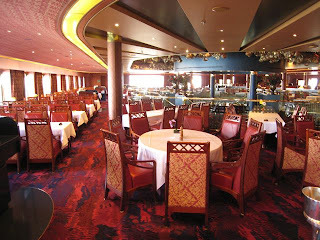 The Vista Dining Room, facing port from center/aft. Photo and copyright Peter Knego 2007. The usual Baked Alaska parade ensued, and while I am neither a fan of the dish, nor the hullabaloo, I must admit, perhaps with the enhancement of a glass of red wine, the line of swizzler-topped confections looked impressive as it wound around the dining room’s two levels. Our waiter did not offer us an alternative until we specifically asked for a dessert menu, which he said was not available. Finally, he fessed up that there was ice cream and a banana strudel, so we chose the latter and found it was, indeed, worth fighting for. On the way out, of course, we saw the “non-existent” dessert menu in the display case. 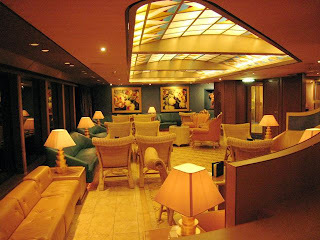 A forward-facing view of the Explorer’s Lounge. Photo and copyright Peter Knego 2007. The Ocean Bar, facing forward. Photo and copyright Peter Knego 2007. 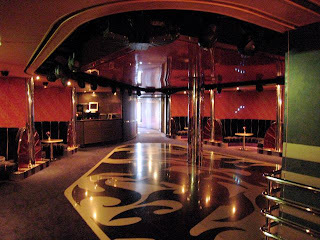 Jazzy’s domain, the Northern Lights Disco, facing forward/starboard. Photo and copyright Peter Knego 2007.
uartet played classics and soothing contemporary music. 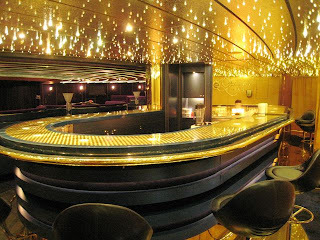 From there, we were off to the lovely Ocean Bar, which overlooked the brightly lit starboard promenade. Pianist Billy kept the more sedentary night owls occupied in the Piano Bar while DJ Jazzy spun a varied and animated set in the SRO Northern Lights Disco, making sure everyone was having a great time. Finally, I joined Christopher for a windy walk around the promenade in the wee hours before retiring to the good news that we could set the clocks back an hour as we entered Pacific Standard time. A tray of room service coffee (HAL’s “regular” coffee is better than that on most cruise ships, thankfully) with muffins helped nurse me awake this morning. In the few hours since my last post, the weather had changed dramatically. The Baja coastline was a distant blur beyond the choppy gray waters and the temperature had dropped some twenty degrees. Drizzle was forecast on the ship’s television monitor. As I caught up on this blog, my eyes glazing into the ether outside, mist was spouting from little fumaroles in the sea. Black crescents cut between the waves, occasionally leaving a dangling tail before disappearing. A pod of whales had joined us for a bit of our northbound journey. I tried to get a few photos of the phenomenon, but the slight shutter delay basically left me with a half dozen views of blurred grayness. Ughi hails from Bandang, Indonesia. Photo and copyright Peter Knego 2007. The elephant in this room has not gone unnoticed! Photo and copyright Peter Knego 2007. Our cabin steward, Ugih, has been exemplary. Another Indonesian man with a gentle heart and committed work ethic, he never failed to have a smile and warm greeting for us, in addition to some splendid towel creations. Cruise Director extraordinaire and home schooling poster child, Jason Venner. Photo and copyright Peter Knego 2007. Piano Bar, facing forward. Photo and copyright Peter Knego 2007. At 5:00, Uncommon Journeys hosted a farewell cocktail party in the Piano Bar, giving us all a chance to say good bye. 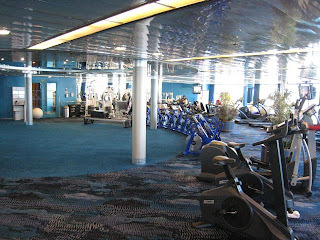 Afterwards, I retreated to the cabin for the sullen packing process, then up to the empty gym for a last work out before a very low key, high calorie dinner at the Lido’s pasta station, making a dent in the OOSTERDAM’s parmesan stores. 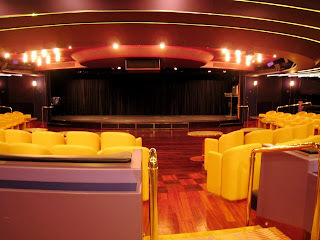 Christopher and I headed to the Vista Lounge at 10:15 for the OOSTERDAM Superstar Finals, where six passenger finalists performed their hearts out for a trio of judges (hello, again, Jason!) in a setting inspired by Pop (American) Idol. Port promenade, facing aft. Photo and copyright Peter Knego 2007. Another walk around those teak promenades before leaving our luggage out, then lights out! 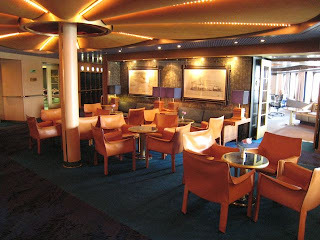 November 10, 2007: Painfully, we had to be in the Vista Lounge at 6:00 AM to clear US immigration since we actually boarded the ship in Mexico. Once that process was complete, we cued up in the clamor of the Lido. My first proper breakfast on the ship (thanks to my sleep-ins), I had a beautiful onion, tomato and cheddar omelet, muesli, fruit salad, and raisin bran to fuel this long, last day. We ate on deck, looking across the San Diego cruise ship terminal to the glistening MV RYNDAM on our port side and the USS MIDWAY on the starboard side. It was a perfect, sunny and warm morning on which to end this adventurous and exciting Uncommon Journey.